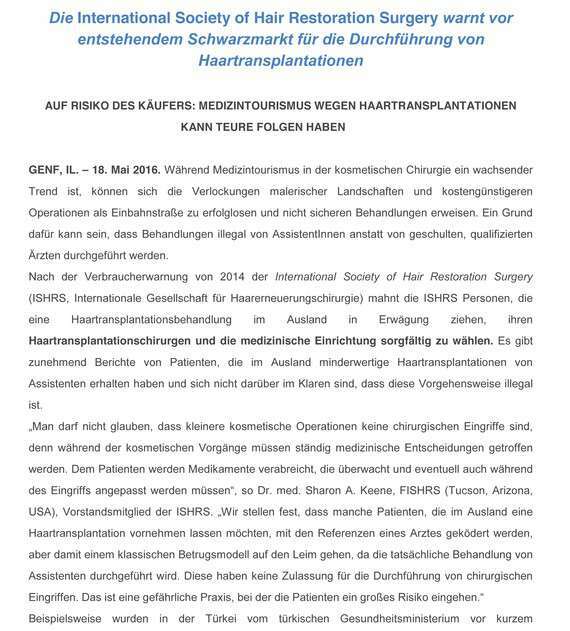 In a news bulletin, the International Society of Hair Restoration Surgery (ISHRS), to which Moser Medical belongs, has warned potential clients and patients against the risks associated with so-called "beauty trips" for hair transplantation. Vienna - Genf, Illinois,USA, 14 October 2016. Complaints are mounting all across the world from patients who have allegedly taken advantage of cheap trips abroad to undergo a hair transplant. A lack of qualified staff and poor hygiene and care standards can quickly turn an apparently good deal into a bad one. Saving a few Euros isn't worth permanent discomfort. In their document, "ISHRS Warns of the Risks in Medical Tourism," the ISHRS explains in detail what risks are involved and what you, a potential patient, should pay attention to when choosing a clinic for your hair transplantation. We at Moser Medical have also been contacted by victims of dubious providers who have received an inferior hair transplant abroad and are looking for a possible fix in their situation. Karl Moser, co-founder and owner of Moser Medical, said: "Providing the highest possible quality of treatment every step of the way has always been our biggest priority. This is for one reason: if you do not do the work properly, hair growth is poor and will not meet the expectations of our patients." Dubious providers sometimes extract (and charge for) more hair than is actually necessary to achieve the desired result. This often prevents a successful subsequent repair surgery, and the damage done is final. The success of a treatment really depends on every individual hair root. To underline this to our patients, and based on our decades of experience, we offer our patients the highest quality treatment as well as a "Total Return Guarantee" and a "Growth Guarantee."